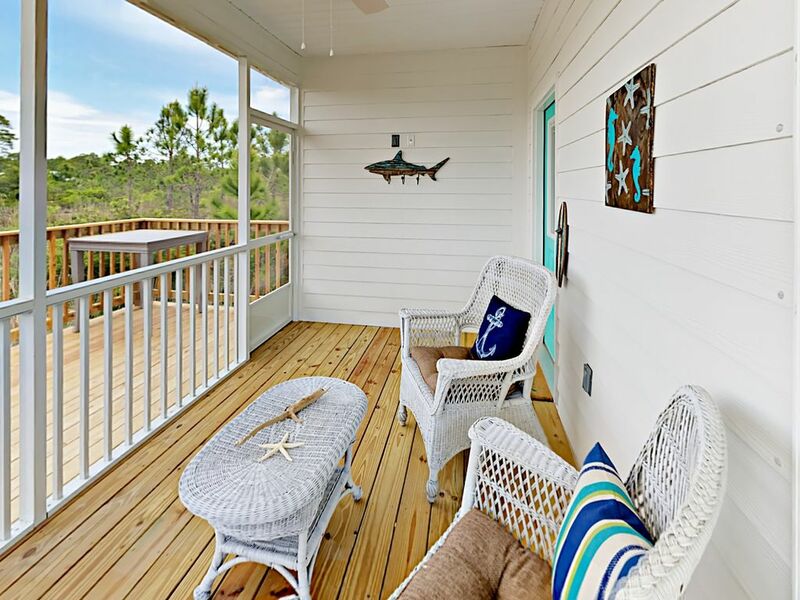 Tucked away in the quaint and peaceful community of The Rookery III, this new 3BR cottage sits across the street from a beach, backs up to a gorgeous bay, and is surrounded by a wildlife preserve. Take advantage of year-round access to two pools and a kiddie pool. After a day of kayaking or canoeing, grill dinner on the backyard deck and enjoy dinner in the breezy sunroom. Unwind in the living room on the comfy leather sofa and love seat while watching a favorite film on the 55” flat screen TV. Or have a game night gathered around the coffee table. Enjoy breezy evenings in the spacious sunroom with comfy seating for your whole party. The chef in your group will appreciate the gourmet kitchen with all-new stainless steel appliances, a glass-top range, ample granite counters, and bar seating for two. When it’s time to eat, convene around the dinner table for six. Kick back in the master bedroom with a king bed, 32” flat screen TV with Roku, and an en-suite bathroom with a shower/tub combination. Two additional bedrooms are located down the hall. The first provides a king-size bed and a 32” flat screen TV with Roku, while the second offers two twin-over-queen bunk beds, a 32” flat screen TV with Roku, and an en-suite bathroom with a walk-in shower. Watch the sun set as dinner grills on the large backyard deck. You’ll also enjoy community amenities, like two pools (one with a kiddie pool), and a kiddie pool. Other perks include complimentary Wi-Fi, a washer/dryer, and driveway parking for two vehicles. Boats, campers, and RVs are prohibited at all times. Golf carts are allowed on-site from Labor Day through the end of February (no exceptions). Head over to Ft. Morgan Marina and book a deep sea charter, then get your catch cooked for you at Tacky Jacks on the water. If you’re a history buff, visit nearby Fort Morgan, a 19th-century fort offering tours, educational programs, and Civil War exhibits. Or ferry to Dauphin Island for a fun day trip. We were very excited to rent this property to celebrate a 75th birthday with a group of 6 ladies. Upon arrival we found the unit in good shape, tidy and what appeared to be clean. Within a couple hours of arrival while eating a casual dinner we received the first of 3 text messages complaining of potential noise violations. We finally determined the drone iPad in the kitchen was monitoring our volume. We all found this to be horrifically intrusive. I would never recommend staying at this unit. We prepared most meals in and found the kitchen missing some basic items like a juicer and a pizza cutter. There was only one small roll of toilet paper supplied per bathroom (we had to make a special trip day 2 for a resupply) and no beach towels or chairs. We absolutely adored this perfect cottage!! This adorable little cottage was the perfect size for our group of 8. Although small in size, the layout was perfect and made every room feel generous!! The decor was relaxing and beautiful! The beds very comfortable and kitchen well stocked for any cooking needs. We especially enjoyed the screened in porch for our morning coffee and the location was fantastic!! We had a short walk to the community pool. It is very close, less than 5 minutes, to public beach access. Less than 5 minutes to food market and several great restaurants. Also, very close to Fort Morgon Historic Site and a lagoon great for kayaking. It was a great vacation in the perfect beach cottage rental! We definitely plan making this rental a regular long weekend vacation! It was a cute little home perfect for 3 couples! It was perfect and had everything that we could need. It was nice and clean and close to the beach. We loved that there was an outside shower to clean all the sand off! I would definitely recommend someone to stay there! Nice relaxed community with a golf cart ride to the beach ! The House was so clean and nice! It had all the comforts of home and more! There was a great beach area down the road. We could see the kids playing at the pool from the back porch. We will definitely be back! The cottage was very comfy, but elegant. It had all of the necessities plus some in the kitchen. It was clean and had all of the comforts of home. It was a little jaunt to the beach, but not bad. It was almost easier to drive just because of all the beach essentials we had, especially with kids. We had a great time on our vacay and would love to go back again! !